magnio | Baby announcement: Torjus is born! Baby announcement: Torjus is born! The result of the development process for the new version is now released: Torjus, born on 2012-06-19 at 21:57 CEST. He was 49 cm and 4400 cm (babies usually come in size large in my family). 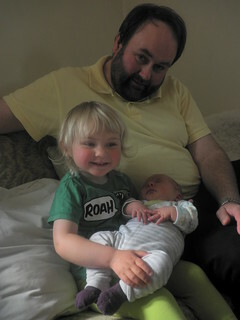 Proud sister and dad with new family addition. Everything is fine, we've been home since Wednesday. Well, not Ada - my parents were fabulous and took care of her most of the week before we return to everyday life again tomorrow! Torjus nurses like a pro, perheps with a slight contribution from his more-so-than-two-years-ago pro mum. Gosh Ada is looking big, I haven't seen pictures of her in a long time! She's growing! And it flt like she had gained t least 10 kg after we got home with Torjus! BI and HEAVY compared to that little bundle.